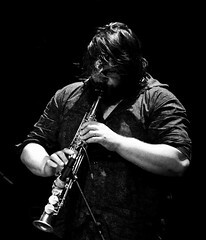 Mario Caribe Quintet. Edinburgh Jazz Festival, July 2008. My last gig of this years festival, and it was a cracker. After the contemplation of Smith, Andersen and Cosker on Friday, the uplifting downbeat of Scottish folk-jazz fusion from Stramash and the verge-of-experimentation from Phil Bancroft, the last gig for me by a local band – albeit one featuring a Brazilian bass player and a New York-based pianist – was straight down the line exciting jazz. Mario Caribe has been a mainstay of the Edinburgh jazz scene for years, and he plays bass in many bands; this, his own quintet (well, it was billed as “quartet plus …”, and there were five people on stage – I reckon that makes it a quintet!) is the least world- and latin-influenced. With Laura MacDonald on tenor, David Berkman on piano (from New York but as the blurb for his own gig said, “such a favourite here, he’s almost Scottish”), Kevin MacKenzie on guitar and Alyn Cosker on drums, Caribe’s band played excellent modern jazz. Using MacDonald’s sax and MacKenzie’s guitar as the two front line instruments, they played a mixture of Caribe’s own tunes, a couple of standards (although as Mario said before one number “this is a standard… in Brazil!”), and a few numbers by other people – including, for me, the best number of the night: “Let’s Say We Did” a lyrical, slow ballad by John Scofield. 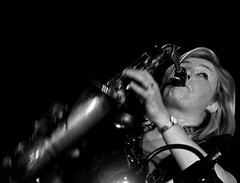 I loved MacDonald’s sax playing (just as well, as I was sitting just a couple of feet away from her), and MacKenzie’s guitar was alternately melodic, jagged and rhythmic. He had to avoid hitting the audience with his guitar, too – the Lot isn’t a large venue! After his softer playing the night before, Cosker was louder and brasher, pushing the music along with Caribe’s lovely resonant bass keeping things flowing at the back. This was a great gig, and a memorable one to finish the festival on! This entry was posted in Jazz and tagged Alyn Cosker, David Berkman, EJF, Kevin MacKenzie, Laura MacDonald, Mario Caribe, The Hub on August 10, 2008 by patrickhadfield. Andersen, Smith & Cosker and the Brian Kellock Trio. Edinburgh Jazz Festival, July 2008. The collaboration between Scottish saxophonist Tommy Smith – winner of a recent award in the BBC jazz awards and Norwegian bass player Arild Andersen goes back a few years; I saw them in the ethereal setting of the Round Church in Bowmore, Islay, which produced a concert of such exquisite beauty that I was a little scared to see them again: how could they possibly match up to that memory, especially with the addition of Cosker on drums? In Bowmore, the combination of the saxophone and the bass had created a mesmeric, meditative sound that was wholly suited to the setting. Andersen had used his ingenuity and some whizzy technology to set up loops of his percussive bass, providing rhythm to which he and Smith played their gentle melodies. How could drums not contrive to break that spell? Particular since I have seen Cosker play before, and he can be a loud, brash and domineering drummer. The trio answered my concerns within moments. Andersen played a series of pizzicato phrases, looped them and set up a complex rhythm; and Cosker joined in seamlessly, working abstractly away from the beat. With Smith playing tenor, they created some magical sounds, mixing jazz and folk sensibilities to create their own sound. It was beautifully contemplative, emotional music, the sounds meshing together to create a vivid soundscape. Stunningly lovely. Andersen, Smith and Cosker were followed onto the stage at the Hub by a trio of Brian Kellock on piano, Chris Lightcap on bass and Matt Wilson on drums. They started off very free and open, Kellock scattering notes seemingly at random, Wilson working his kit and an assortment of hand-held percussion in response, leaving Lightcap to hold it together. This worked really well, the three of them creating an abstract space to explore. After about ten minutes, the pianos chords resolved into “The Way You Look Tonight”, and Kellock started to play it straight ahead in the mainstream. After the experimental start, I thought this would be temporary, Kellock showing where he had come from and that he could play different styles. Instead, they were firmly stuck in the mainstream for the next hour or so. This was a pity. They didn’t match the interest they had generated early; they played it very straight – it was good, they knew what they were doing, and they played some great standards, but it wasn’t the same. 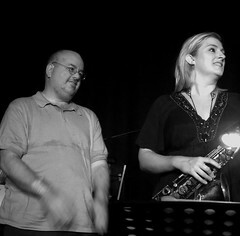 They were joined for the last three numbers by Lianne Carroll as guest vocalist. I don’t particularly like jazz singers – and as jazz singers go, I thought Carroll was all right – the vocals didn’t impinge too much – she was using her voice as an instrument in the ensemble, rather being the dominant voice – but it wasn’t what I wanted to hear. Perhaps I had been spoiled after the wonderful set by Andersen, Smith and Cosker; either, I wasn’t especially enamoured of the trio. All right as far as it went, but they had shown so much more promise. 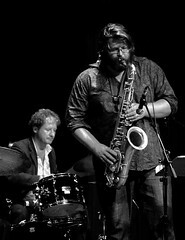 This entry was posted in Jazz and tagged Alyn Cosker, Arild Andersen, Brian Kellock, Chris Lightcap, EJF, Matt Wilson, The Hub, Tommy Smith on August 9, 2008 by patrickhadfield. Colin Steele’s Stramash. Edinburgh Jazz Festival, July 2008. The third gig in a row, and it was back to the Hub to see Colin Steele’s Stramash. I have seen this band a few times before – Steele’s usual quintet augmented by a cello, a trio of fiddles (well, two fiddles and a viola on this occasion) and a piper (I think he was playing Northumbrian pipes and Scottish bagpipes). I last saw them in the jazz festival two years ago, and that was a cracking gig – so I had high expectations this time around. I wasn’t disappointed: this was a great party of a concert. There is something so fun and life affirming about this music that it isn’t possible for me to hear it and not smile. It is just great. Still, they haven’t changed the music much in the last two years: they played more or less the same set, with arrangements of Steele’s quintet recordings for the expanded line up in the first half and then a suite of tunes written on or about Islay in the second. It was much the same band as well, although apparently a couple of the fiddlers and the piper were new – it was the piper’s first gig. Phil Bancroft played tenor and soprano, and he and Steele provided most of the solos. 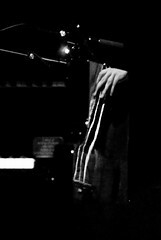 Dave Milligan was superb on the piano, as always – he is understated and reverent, and plays just beautifully. (He also does all the arranging.) 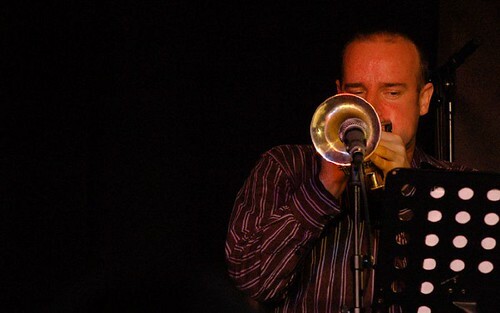 Aidan O’Donnell and Stu Ritchie made up the rest of the quintet, and they were as good as they had been with the Phil Bancroft Quartet the previous Saturday. But it is the extra textures provided by the strings and pipes that really make this band: they add an awful lot. Normally, I dislike strings with jazz; I think they really don’t mix well. This band is one of the exceptions. My own take on it is that both Steele and, more importantly, Milligan have spent a lot of time playing in folk bands as well as jazz, and the original music can be somewhat folk-infused. Adding the strings and the pipes brings this out, so that you get a true fusion of the two traditions. I think the original tunes are wonderful by themselves – in concert with the expanded band, they really come to life: this is jazz as ceilidh, joyous and mournful (often at the same time). Steele said that Stramash have now recorded the Islay suite, and I can’t wait to hear the record, too. This entry was posted in Jazz and tagged Colin Steele, EJF, Phil Bancroft, Stramash, The Hub on August 7, 2008 by patrickhadfield. 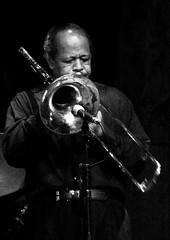 David Murray “Black Saint” Quartet and the Dizzy Gillespie All Stars. Edinburgh Jazz Festival, July 2008. On consecutive nights, the Hub played host to big names from the States: on Tuesday, the David Murray’s “Black Saint” Quartet, and on Wednesday, the Dizzy Gillespie All Stars. It was an interesting juxtaposition: Murray is, to quote the Bible, “the most formidable tenor soloist of his generation”; the Dizzy All Stars (sans Dizzy, mostly because he died fifteen years ago) reflecting an earlier time, when bebop was revolutionary. I had seen Murray play a couple of times – but not for about twenty years. Still, like everyone else in the hall, I gave him a star’s welcome – several minutes of applause. He had a youngish band with him – the names (Lafayette Gilchrist – piano; Jaribu Shahid – bass; and Hamid Drake – drums) meant nothing to me. And they started right into it, belting out a raucous tune. It did nothing for me. Nothing at all. Murray’s tenor sax sounded like a strangled goose, honking away. He was fast – he had a lot of technique – but it communicated nothing to me except that the notes were spilling out, falling in all directions. The band powered behind him, driven by Drake thrashing away (he was loud). Gilchrist’s piano was laying down subtle and not-so subtle chords behind him, and Shahid was plucking awat solidly. But so what? It left me completely unmoved: it was just a torrent of notes. They seemed to take themselves so seriously. Murray dedicated one number to “the next president of the United States – Barack Obama!” (everyone cheered); he introduced another – a much softer, slower number featuring his rather lovely bass clarinet playing (the first time I felt engaged during the show) – as the theme tune to a TV series about racism. After that, Murray was back on tenor, strangling a whole flock of geese as the notes poured – he was very fast. Finally, after an interminable drum solo – jeez, it was loud, fast and boring full of sound and fury, signifying nothing – I had had enough; I left. I had sat there for an hour, waiting to be entertained or moved. Maybe if I had heard more bass clarinet? Whatever it was – whether it was me or the band, I had heard enough. I reckoned it must be me – the rest of the audience seemed enthralled, loudly cheering the drum solo, hollering between numbers whilst I was left cold: maybe some mood had enveloped me in a fog, obscuring the music. Either way, my mood lifted considerably when I left. By the way, before the band came on, they asked that no photographs of any kind were taken; so I left my camera in my bag. Which is a shame – I was looking forward to adding the most formidable tenor soloist of his generation to my collection of saxophonists! Following Murray, I didn’t have hopes for the Dizzy All Stars: my expectations were very low. How wrong I was: within a couple of beats they had won my heart. Perhaps this was down to familiarity: just seconds after coming on stage, they launched into a blistering version of “Salt Peanuts”, and after that they could do no wrong. The band consisted of James Moody on tenor, Slide Hampton on trombone, with Greg Gisbert having the unenviable task of taking Dizzy’s role on trumpet and a rhythm section of John Lee on electric bass, Eric Gunnison on piano and Vince Ector on drums. The energy with which they performed was astonishing, given that Moody is 83 and Hampton, 76, had suffered a stroke in June. True, Hampton’s playing wasn’t at its best, but Moody was on storming form, playing. They didn’t play anything else with the verve and speed of their opening number, but by then they had the audience. A stream of standards followed from Gillespie’s heyday. Gisbert was excellent, but it really seemed Moody’s show: he kept up a banter with the audience, sang a couple of songs (including a rap, surprisingly), and belted out some great sax solos. So why was this so much more fun than the previous night? Well, it looked like they all wanted to be there: they brought a real warmth to the stage. They seemed to be enjoying themselves. And they played fun tunes. It was – well, just fun. This entry was posted in Jazz and tagged David Murray, Dizzy Gillespie, EJF, James Moody, The Hub on August 7, 2008 by patrickhadfield. The Stan Tracey Quartet. Edinburgh Jazz Festival, July 2008. The second gig was the Stan Tracey Quartet – another band with just saxophone as the solo horn. I love Stan Tracey: when I was discovering jazz, it was hearing Tracey playing in London that helped me make sense of Monk: it was as if Tracey was the missing link between Ellington and Monk, because he sounded like both, simultaneously. (It was only a good while later when I heard the absolutely essential Money Jungle that I realised that, actually, Ellington himself was the missing link between Ellington and Monk: in a trio with Charlie Mingus and Max Roach, Ellington sounds like the most modern of the modernists.) 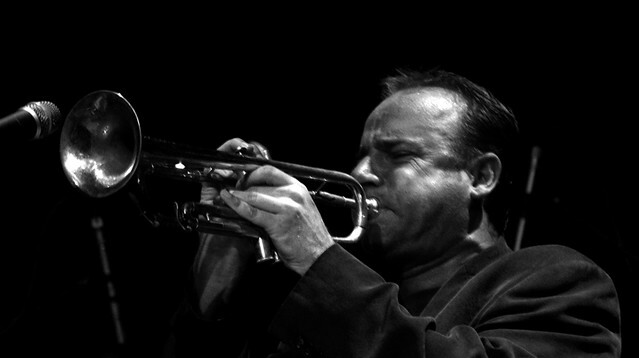 Tracey’s website calls him the “the godfather of British jazz”, and they got that about right. So I was really looking forward to this gig, although I must admit there was a somewhat morbid reason for going, too: Tracey is now in his eighties, and I simply had to take the opportunity to see him play whilst I could. 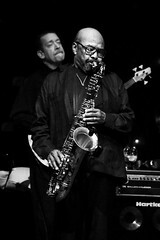 The quartet featured Bobby Wellins on tenor; Tracey and Wellins have been playing together for more than forty years. It was themed around Monk, and they covered the repertoire – all one’s favourites. There was a great solo version of Round Midnight; they played In Walked Bud, the onomatopoeic I Mean You; Well You Needn’t; and they finished with a fine version of Rhythm-A-Ning. Wellins led a great version of Monk’s Mood. Monk’s music is jagged and angular; it sounds like it shouldn’t work – still, after all this time – but it does: the notes fit together and the rhythm somehow meshes. These tunes used to be avant-garde; now they are standards. 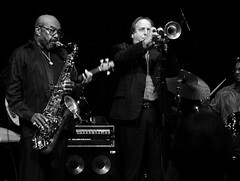 The quartet was made up with Stan’s son Clark on drums and bassist Andrew Cleyndart. Thing is, it was a good set, but it lacked fire. It sounded like they’d been playing the tunes for thirty years, and they knew what was going to happen next. This is hardly surprising – because Tracey and Wellins have been playing these tunes for fifty years. And it did sound good; just not great. It was wonderful to hear the tunes, but there was almost too much familiarity to them now – they have lost the ability to surprise and shock. It was great to see Tracey and Wellins venture back north, though. This entry was posted in Jazz and tagged Andrew Cleyndert, Bobby Wellins, Clark Tracey, EJF, Stan Tracey, The Hub on August 6, 2008 by patrickhadfield. 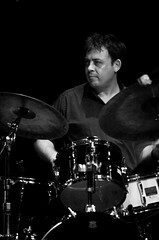 Phil Bancroft Quartet. Edinburgh Jazz Festival, July 2008. My first gig of this year’s jazz festival was the Phil Bancroft Quartet at the Hub – indeed, all but one of the gigs I went to was at the Hub (in contrast to last year, where all but one was at the Spiegel Tent). It was a hot Saturday afternoon, and I didn’t feel like sitting in a darkened hall listening to jazz; but this quartet quickly blew the cobwebs away. They played a varied set – Bancroft explained how he liked different styles of music to do different things emotionally – and the tunes spanned a dynamic range, drummer Stu Ritchie somehow achieving the wonderful feat of being energetic and driving whilst playing with care, precision and – best of all – quietly: Ritchie was excellent. 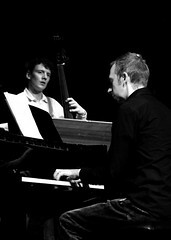 But then this band has pedigree, with the wonderful Aidan O’Donnell on bass and Paul Harrison on piano. 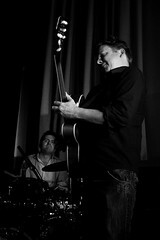 It was a fun gig – the music seemed to express Bancroft’s quirky humour – and the playing was excellent throughout. Bancroft said that someone had told him he looked like the recently discovered Radovan Karadzic, and we shouldn’t be surprised if UN forces burst in to drag him off to the Hague; but the person behind me said he looked rather more like Hagrid. This entry was posted in Jazz and tagged Aidan O'Donnell, EJF, Paul Harrison, Phil Bancroft, Stu Ritchie, The Hub on August 5, 2008 by patrickhadfield. 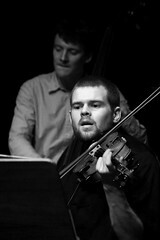 Ethan Iverson Quintet: Play Monk. Edinburgh Jazz Festival, July 2006. Iverson’s third outing at this year’s Edinburgh jazz festival, this time with a band of local musicians playing the music of Thelonious Monk: Colin Steele on trumpet, Laura MacDonald on alto sax, Aidan O’Donnell on bass and Alan Cosker on drums. With other musicians around him, Iverson was more relaxed than earlier in the week. The angular, jagged character to Monk’s compositions suited Iverson’s style – he said he had been playing these tunes since he was fourteen (which I would guess means the last twenty years or so) – and he played with a lot of energy, launching out of the piano stool to hit the notes. Steele was on fine, fiery form, driven along by the piano; he played some excellent muted trumpet, and he brings a great deal of pyrotechnic excitement to the bandstand. 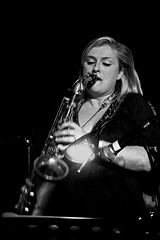 MacDonald, who had already played a solo gig that night, was flying, her solos building within the structure of Monk’s tunes. Iverson gently prodded the keys behind the soloists, a few piano notes adding just a touch of texture. Iverson avoided the better-known of Monk’s tunes – there was no Round Midnight or Blue Monk – but they covered much of Monk’s career. Misterioso, Well You Needn’t, Crepuscule With Nellie and what sounded like Monk’s Mood (it was name checked as Ask Me Know – not a track I know) were all featured. There were only two non-Monk compositions – a sax feature of Body And Soul from MacDonald, and a beautiful version of Angel Eyes for Steele. Whilst the music was excellent, there was little re-interpretation of these classic tunes. Iverson was working from recently published versions of the music, derived from the original manuscripts, and he could have brought some more of himself to the tunes. This entry was posted in Jazz and tagged Aidan O'Donnell, Colin Steele, EJF, Ethan Iverson, Laura MacDonald, The Hub, Thelonious Monk on August 7, 2006 by patrickhadfield. Ethan Iverson. 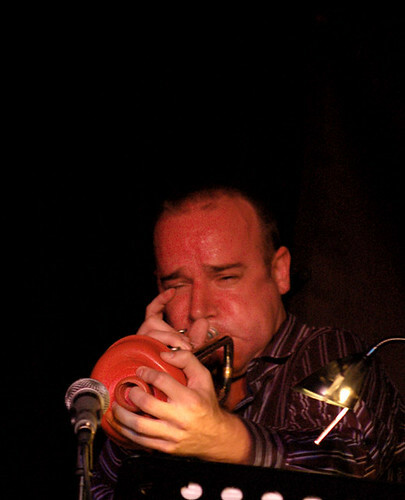 Edinburgh Jazz Festival, July 2006. The pianist in The Bad Plus trio, Iverson said he was unaccustomed to playing solo gigs now, and he appeared slightly nervous. 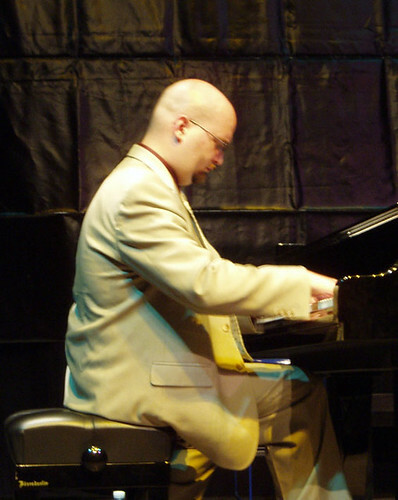 Unlike the iconoclastic Bad Plus – who cover all kinds of material (including Abba, Nirvana and Black Sabbath) – Iverson played a set of jazz standards, tunes deeply engrained in the fabric of jazz music – many of the tunes coming from the Frank Sinatra songbook. It could just be that Sinatra covered all the standards, of course. Iverson started the concert by playing the tunes pretty straight: he began sounding like Art Tatum, with lots of arpeggios up and down the keyboard. He then stretched out and became more modernist, more Monk-like. 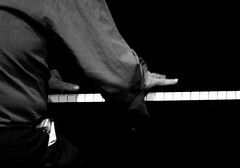 He became very animated, his feet pounding the floor intensely, hitting the keys and standing over the keyboard. He became more adventurous as the evening wore on, deconstructing the later tunes and then building them back up. He played a sombre – or, as Iverson described it, “unusually depressing” – version of Stardust – he hit some wrong notes in the introduction, and he said he never recovered. Sombre, but beautiful. It was a captivating gig, Iverson putting a lot of energy into his playing and producing some striking music. 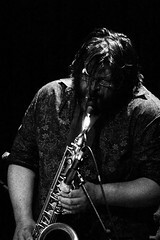 This entry was posted in Jazz and tagged EJF, Ethan Iverson, The Hub on August 7, 2006 by patrickhadfield. Tord Gustavsen Trio. Edinburgh Jazz Festival, July 2006. A sell-out show at the Hub was appropriate for Gustavsen, a pianist who frequently referred to his pieces as “wordless hymms” – the Hub, like most of the other medium sized venues in Edinburgh is a converted church (and a very fine building it is too – you can see views of it here). His trio played with a quiet, precise elegance – beautiful, subtle tunes which build layers of minimal music until the whole is quite transformed. in doing so, they build up a large amount of energy, too – surprising if you have only heard their music on disc. There was a sparseness to Gustavsen’s playing that worked well with the spiritual (if not bluesy) material. The three musicians – Gustavsen’s regular band of Harald Johnsen on bass and Jarle Vespestad on drums, playing only a two-drum kit – were completely at ease within the music, working together to move it forward. Though the trio bears Gustavsen’s name, Johnsen and Vespestad bring much to the party, enabling the pianist to develop his ideas. 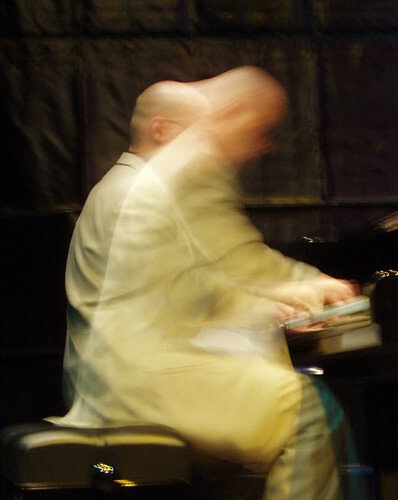 As the music developed and the themes developed, Gustavsen contorted himself to reach the keys, crossing his hands and stretching the length of the keyboard. Vespestad was particularly impressive, playing with an intensity that is rare whilst never overpowering the subtleties of the music. His brush work was equisite, providing a gentle energy, pushing the music along. The concert finished with him playing “air drums” – the swish of the brushes through the air being enough to keep the rhythm going. The audience were deeply respectful – almost awestruck, they waited until the last resonance, the last sound of each tune had escaped the piano before applauding. The applause was loud, genuine and heartfelt – this felt like a very special, personal occasion. This entry was posted in Jazz and tagged EJF, The Hub, Tord Gustavsen on August 7, 2006 by patrickhadfield. Colin Steele’s Stramash. 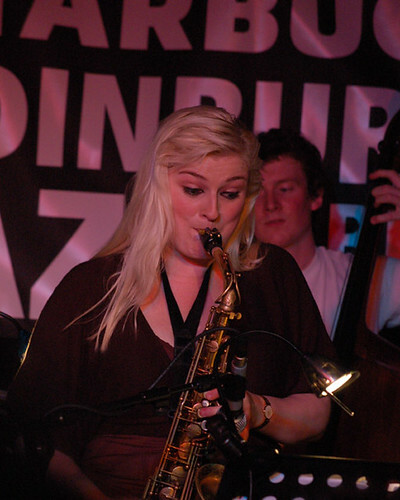 Edinburgh Jazz Festival, July 2006. Stramash is Steele’s regular jazz quintet augmented by three fiddlers, a cellist, and a piper; part jazz, then, and part something else. The fiddlers – and they were definitely fiddlers rather than violinists – and the piper give the lie: there is a lot of folk in trumpeter Steele’s new band. The first set comprised of older numbers which had been re-arranged by pianist Dave Milligan for the larger ensemble. Whilst some jazz-with-strings becomes syrupy and anodyne, the fiddles gave a dynamic, rough edge, balanced by the softer cello. 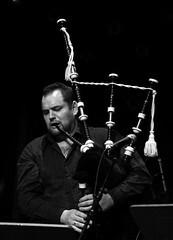 The pipes emphasised the celtic atmosphere of Steele’s tunes, which are firmly rooted in Scottish locations and tradition. Steele’s trumpet took much more of a backseat role – at times he was simply conducting the strings – as he let the pipes and strings take the lead. The second half of the concert comprised music composed specially for this band, inspired by a visit to Islay. The music invoked the island well, some tunes reflecting places (Loch Indaal, the Round Church) and others moods (“Farewell My Love” – a lament to leaving the island). 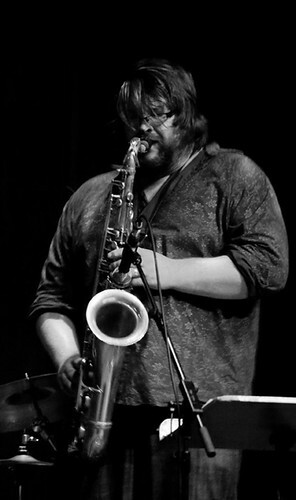 Phil Bancroft played some storming and lyrical tenor and soprano sax solos – in duet with Stu Ritchie’s excellent drums in “Louis’ First Gig” and “The Simpson’s Jig”, another in trio with Ritchie and Milligan, the drums and piano supporting Bancroft as he let fly. Milligan was excellent throughout, playing some beautiful, mournful solos, and Aidan O’Donnell kept the whole unit together on the bass. The fiddles knew how to swing, bringing a foot-stamping party spirit to some parts and a soft, Highland lament to others. This was an energetic, entertaining concert, which brought the audience to its feet, hollering in the ceilidh spirit. This entry was posted in Jazz and tagged Aidan O'Donnell, Colin Steele, Dave Milligan, EJF, folk, Phil Bancroft, Stramash, The Hub on August 7, 2006 by patrickhadfield.